Lebanon, In the Aramic Language spoken as “ Laban "(=yoghurt )" Thet white Mountains” lies in the Middel-East between Syria and and Israël/ Palestina and the Medtirean see. The surface of country is 10.452 km², around 1/5th of the Netherlands, 1/3rd of Belguim and 1/23 of the United kigdom. Typical for the country are the two mountain ranges Western and Eastern ranges. Along the coast lies the Lebanon mountains with the highest mountain in the Middel-East Qurnat as-Sawda (3.088 m). To the east of of the Lebanon Mountains lies the Bekaa Valley along the length of Lebanon,some 300 kilometers. Typical for the Bekaa Valley, 900 to 1600 meters hight, is its reachness on water and minerals. The Lebanon mountain ranges protects the Bekaa Valley from the heat in the summer. To the east lies the anti- Lebanon mountain ranges with it highest mountain the Sanine ( 2630m). Lebanon has some 4,467 miljoen inhabitants (WB. 2013).It is a melting pot of the three major monotheistic religions: Christianity, Islam and Judaism. The state recognizes 16 faiths, including Jewish. 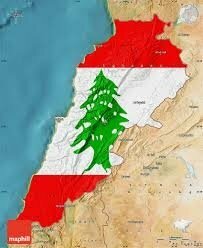 Lebanon became independent (French mandate from 1920 to 1943) of France in 1943. The economy runs on the banking sector and services such as tourism and hospitality industry. A significant proportion of the national income comes from the millions of Lebanese expatriates. Approximately 38% of the land is cultivated with grain, vegetables, fruits, tobacco and olives, and livestock. The industry ranges from cement to textiles, clothing, furniture, canned food and light meals. • 7000 BC: Lebanon is located in a triangle of viticulture is the cradle formed by the Caucasus (present-day Armenia and Georgia), Mesopotamia (modern Iraq) and Palestine. Modern science will be prudent that the wine originated in Lebanon. The Phoenicians 5,000 years ago brought the first vines along the coast in contact with other cultures. Excavations near the city of Byblos have found evidence that wine has played an important role in the Phoenician religion. The Greek god Dionysus, Bacchus the Roman god have their origin in the wine rituals from Canaan. In the city of Baalbek are the ruins of the Temple of Bacchus, built by the Romans in the 2nd century BC in honor of their Bacchus. There are many depictions of vines and wine consumption. • 3000-330 BC: Phoenician traders were exporting their wines to Egypt, Cyprus, Greece, Rome, Sardinia and Spain; Robert Ballard, (see link: http://newsoffice.mit.edu/1999/ships-0714) an oceanographer from the United States, found two Phoenician wrecks from 750 BC containing a cargo of wine which was still intact. The wine seems by the Phoenicians to be protected by a layer of olive oil on the wine and then sealed with a stopper with pine wood resin. Lebanon's reputation for producing quality wines continued into the Middle Ages, with wines from Tyre and Sidon which were much appreciated in Europe and marketed by Venetian merchants. • 1857: Missionaries of the Jesuits introduced new methods of viticulture and winemaking. They planted Cinsault, which came from the French-controlled Algeria, in Zahle District in the Bekaa valley, making them founder of the modern Lebanese wine industry.. The French engineer Eugène François Brun founded in 1868 Domaine des Tourelles on. • 1918: Between the two world wars was the French influence that promoted the culture of wine drinking. Through its role as a financial center and cosmopolitan Lebanon experienced a golden age, creating new opportunities for a thriving wine culture. In the 60s of the last century there were some six to eight wineries active in producing wines. Chateau Nakad was founded in 1923 and Gaston Hochar began in 1930 Château Musar. • 1975-1990: Lebanon slipped into a 15-year civil war which hindered the development of the wine sector, the production of wine decreased tremendously. After this war, the only known wine producers were Ksara, Kefraya and Musar. • 1992 - present: only in the early 90th viticulture was given new impuls with the creation of Domaine Wardy in 1997, Massaya in 1998, Château Saint-Thomas and Heritage. The French influence remained undiminished. The current peace offers new opportunities and creates an unexpected growth. The 2006 conflict incidentally, did not change much on the progress of new developments. It was harvested later than usual, some wine estates Thus missed by a hair of their harvest. Massaya's harvest was unfortunately still totally destroyed. Despite - or perhaps because of - the turmoil increased the demand for Lebanese wine. The conditions in which the wine of Lebanon, are not easy. In 2006 raged a brief but intense war with Israel, with tragedies on both sides and more than 1,000 deaths. But the worst was the civil war from 1975 to 1990. In Lebanon, many infrastructures were destroyed and there were 150 000 deaths and hundreds of thousands wounded. The 2006 harvest was done by office staff, cleaners, managers and truck drivers, because pickers were not found due to the conflict with Israel. At Chateau Ksara, the load of a tractor neighbors with new pipelines for irrigation, were seen as weapon. A missile destroyed the tractor, causing widespread damage. But the harvest and vinification just went on.The population continues to be positive and think with optimism to the future. With every war or conflict will be more determined to continue. In 1998 there were only five wineries of significance. The current viticulture takes place mainly in the western Bekaa Valley - around Baalbek - where it's warm and sunny - and the hills above Zahle, but some producers are experimenting with a new terroir - especially in Batroun and Jezzine, but also in the eastern Bekaa valley. Despite the many conflicts nowadays there are some 60 or more wineries producind around 12 million bottles of wineapproximatly 3,000 hectares of vineyards. The two largest producers, Ksara and Kefraya, together account for two-thirds of the national production. A recent development is the establishment of new businesses outside the Bekaa Valley. We now find producers in Batroun, Khinchara, Tarshish, Aley, Zahleh and Jazzin in the south. Each year again 100 to 200 ha of new vineyards.. Some 50% of the total production of Lebanese wine is exported mainly to the United Kingdom (32%), France (17%), the USA (14%) and Canada (5%). Some wine producers from the Union Vinicole du Liban work towards the establishment of a wine institute that draws up stricter rules for viticulture and wine production and provides control and enforcement. There is still too little regulation now. The most important wine companies, however, have been working responsibly to participate internationally. Although three quarters of the wine producers Are Christians, everyone realizes how important the wine sector in Lebanon. Soil and climate of most of Lebanon consists of limestone and minerals that makes it possible to produce elegant wines. Due to the dry climate in the entire period, flowering and ripening of the grapes come here no adverse (mold) for disease, so that it is not necessary to apply pesticides as pesticides. The purity of the wines is thus guaranteed. The Bekaa Valley is the main production area of ​​Lebanon. The region is dry and sunny summer with temperatures up to 40 ° C, cool nights (10 ° C) by the high altitude and regular rainfall, preventing desertification takes place. In the summer, often dry wind blows from the Gulf or Egypt. Winters are cold, with low temperatures and heavy snowfalls, but there is seldom any frost damage. The area has its own natural water balance, thanks to melting snow on the peaks of the Lebanon and Anti-Lebanon mountain ranges, so some varieties are rarely mature before mid or even late September. The returns are on average 31.5 hl / ha rather low. The major wine producers in Lebanon are located in the southern part of the Bekaa Valley, mostly at an altitude of 900-1300 meters. The stony soil is rich in limestone, with a top layer of clay or loam, and sometimes with stones, gravel or red soil. The new hilly wine region lies on the coast Batroun, north of Beirut. In this second wine region of Lebanon have settled all eight wineries. The vineyards are situated at 400-1750 meters and some have views of the sea. South of Beirut to Jezzine and even further south to find a number of wineries. Thanks including special terroirs and mesoklimaten they are very successful. Château Ka has its vineyards replanted in the Baalbek. We are currently experimenting with grape growing on measuring 2300 meters in the Rasel. It is mainly the French and Mediterranean grape varieties grown in Lebanon. Red - cabernet sauvignon, cabernet franc, malbec, petit Verdot, Merlot, Cinsault (bush vines), carignan, grenache, syrah, mourvèdre, pinot noir, gamay, tempranillo. White - Chardonnay, Muscat, Sauvignon Blanc, Sémillon, Viognier, Gewürztraminer, Clairette, Ugni Blanc. The indigenous white varieties Obaideh Merwah and are usually used for the production of arak, an anise brandy with green, but there is Musar white wine. Some vineyards now have vines along wires are tied, instead of bush vines, depending on the grape variety. All the work in the vineyards. Typical of the Lebanese winemakers is that they dare to experiment. Although most have studied in France, they are not tied to the French rules and have a free hand to experiment. The warm days and cool nights allow the grapes to thrive. The cultivation starts from 500 and runs through to 1700 meters altitude.